For my first recipe I thought I’d post something that has gone down so well at our place that I’ve made it four out of the last five weekends. I was looking for a recipe in which to use a couple of overripe bananas and I came across this post on Delicious Delicious Delicious. It was perfect for me because I had everything I needed in the house and I didn’t feel like walking to the shops. 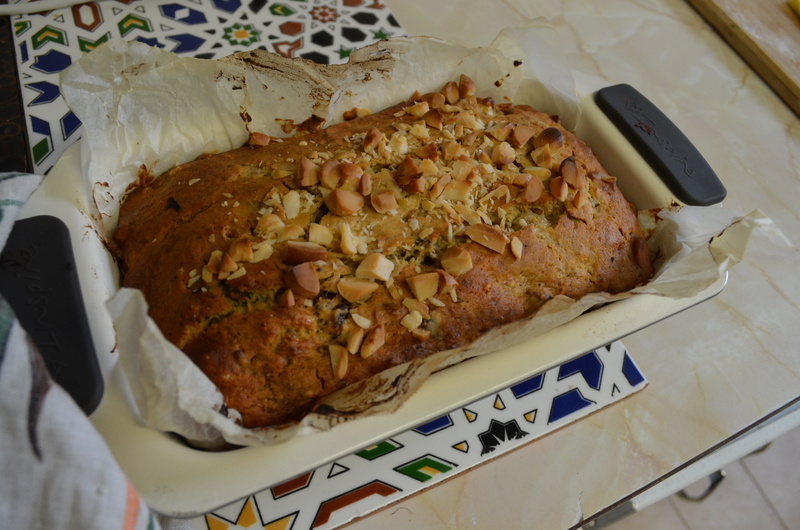 I substituted macadamias for the walnuts of the original recipe because that’s what I had in the cupboard- they are equally well suited to the loaf. I whacked the macadamias in the oven to brown while it was preheating – this is totally optional though! The first time I tried the recipe I used gluten free flour + baking powder and substituted half of the butter with some natural yoghurt that I needed to use. It was really tasty (my taste testers Bec and Jackie agreed it was nice warmed up), and the most dense and moist of all the versions I’ve made, more puddingy than loafy. 2. Pop your chopped apricots and dates in a small bowl with the boiling water and soak for 15 minutes. 3. Sift flour and baking powder into a large bowl and add the sugar, butter and the egg, if you’re using it. If your butter isn’t nice and soft you’ll have a hard time combining the ingredients properly at this stage. 4. Spoon the soaked fruit into the large bowl, leaving the liquid in the small bowl for now. If you’ve used an egg, your mixture may be moist enough without adding the water you’ve soaked the fruit in. 5. 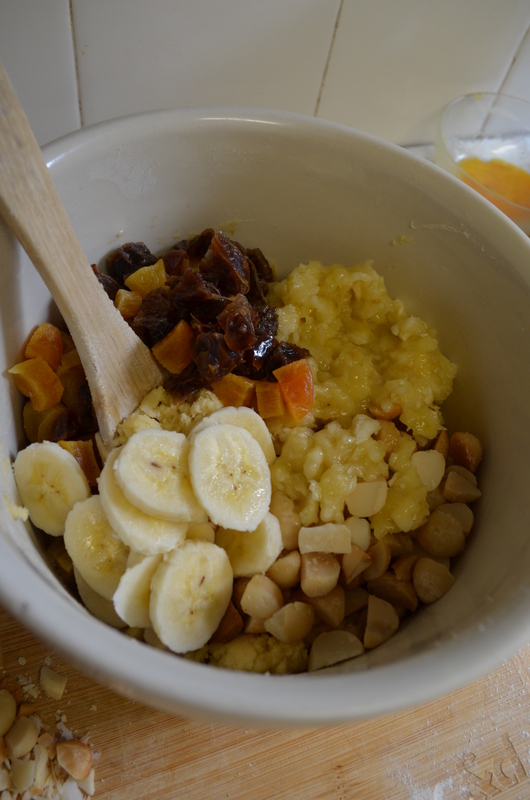 Add the nuts (keeping a couple aside for the top) and banana and stir until well combined. At this stage you should be able to tell whether you need to add the rest of the water used to soak the fruit. 6. When you think your mixture looks good, double check that it’s all stirred through and add it to the lined tin. 7. 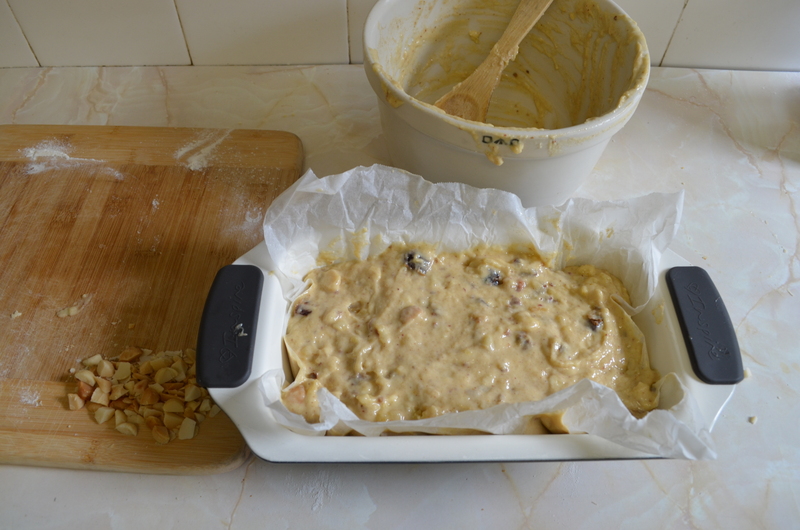 Sprinkle the extra nuts on top (I sometimes sprinkle a bit of nutmeg or cardamom on, too) and pop the tin into the oven for around an hour or until a metal skewer inserted into the loaf comes out clean. The loaf freezes really really well and can be eaten cold, warm or toasted with a little bit of butter. It’s so yum and, as you’ve read, super easy to make on a lazy Sunday. Dad and I have been loving this cake at all times of day, and we’ve been cutting it into around 8 slices and freezing the majority of them to take for lunch during the week. 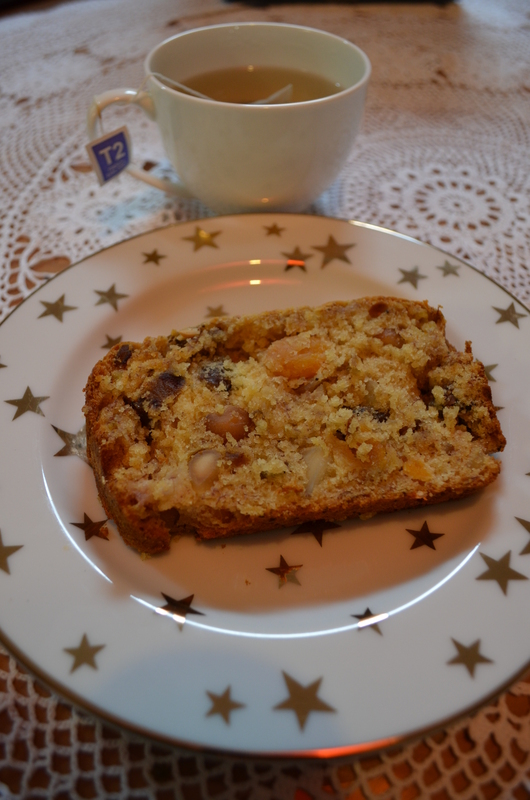 And of course, it’s beautiful with a cup of tea in the afternoon (my favourite is the French Earl Grey from T2). I hope you’ve enjoyed this post and I’d love to hear how you go trying the recipe. ← I stopped procrastinating and finally made my blog!